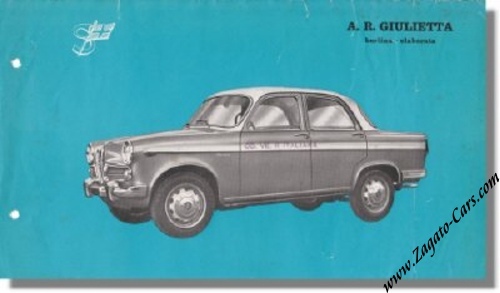 1956 Alfa Romeo Giulietta Berlina Scioneri Elaborata Sales Leaflet. This is an extremely rare vintage ca. 1956 sales leaflet for the Alfa Romeo Giulietta TI Berlina Elaborata as issued by Carrozzeria Scioneri in Savigliano, Italy. Scioneri made an "Elaborata" version of the Giulietta which mainly consited of two-tone painting although there are also versions know where the bodywork was modified. This sales brochure measures some 26 x 15 cm or 10 x 6 inches and is single sided. There is no text or specifications. Caries a smal rubber stamp as visible in the scan.